What a fantastic year with the 2018 CVES Classic! Great families, valued sponsors and friends of Canyon Vista came out to enjoy a day in the sun and an evening of fun. We cannot thank everyone enough for the time and effort that went into making this year another success – and to all of our wonderful sponsors for helping everyone stay hydrated, well fed, and of course winning big! Until next year…. Canyon Vista Elementary School invites you to participate as a sponsor, donor or golfer in our second accrual golf tournament. CVES is a public school with high performing students. As a PTA, we strive to enhance the students learning environment and help them excel while funding programs such as our Science Lab, Math and Engineering Lab, Art and Music programs, Technology upgrades and so much more! 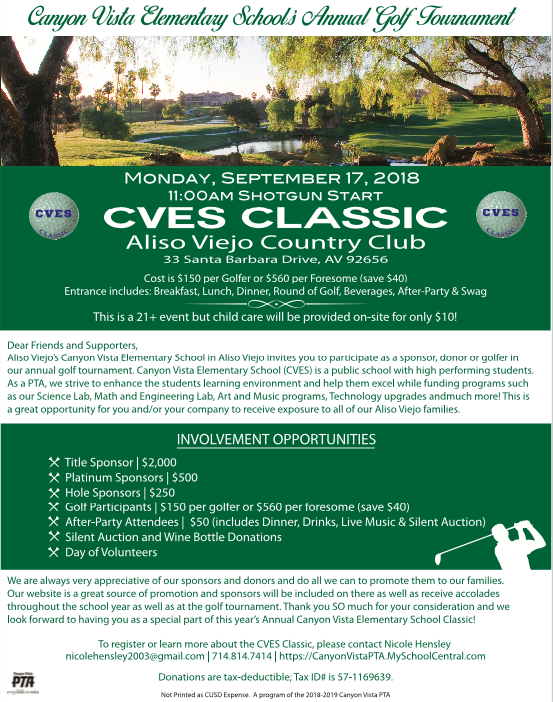 This is a great opportunity for you and / or your company to receive exposure to all of our Aliso Viejo families. We are always very appreciative of our sponsors and donors and do all we can to promote them to our families. 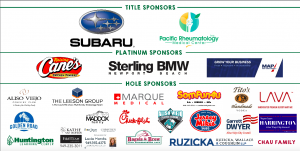 Our website is a great source of promotion and sponsors will be included on there as well as receive accommodates throughout the school year and at the golf tournament. Thank you SO much for your consideration and we look forward to having you as a special part of this year’s CVES Classic! To register or learn more, please contact Nicole Hensley at nicolehensley2003@gmail.com or 949-609-3302. Tickets and sponsorship packages are also available here.